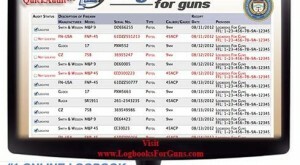 Logbooks for Guns provides a virtual and paperless way to log your guns. The software contains detailed fields for logging, such as the date of when you purchased the gun to when you sold it. You can even add addresses and personal information for each gun logged. The benefits of logging your guns are endless. In a sense, it can be a type of security. Having the knowledge at your fingertips about any gun in your inventory can give you an upper hand, no matter what they question may be and from any location with internet access and a device. Categorize guns by pistols, long guns, NFA, shotguns, etc. Watch our Demo Tutorial on using our software below! This entry was posted in ATF Compliant, Logbooks For Guns, Uncategorized on May 8, 2015 by sales@logbooksforguns.com. Are You Looking to Move to Electronic Bound Books But Have Questions?